Harvestmoon Aki Mugi is a 6% Belgian pale ale from Harvestmoon, based in Chiba, Japan. It’s been in and out of retirement than your favourite Japanese tarento and seems to have come back into the autumn seasonal range. The only think that Harvestmoon Brewery say about Harvestmoon Aki Mugi is that it uses 1.6 times the usual amount of malt compared to their regular beers. 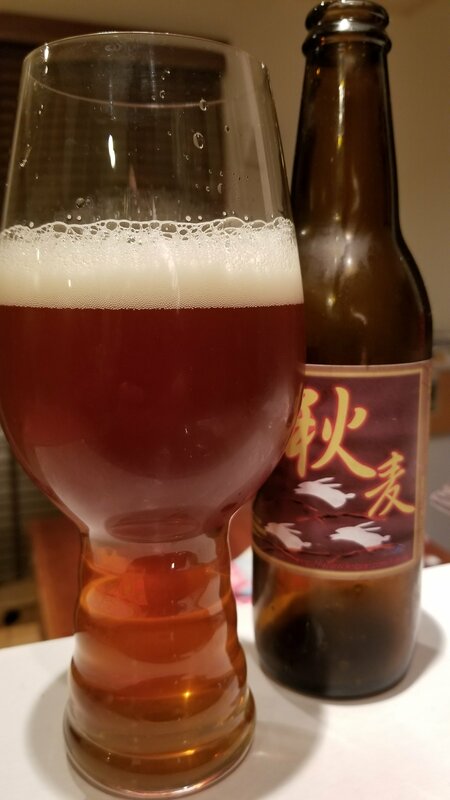 Well Harvestmoon Aki Mugi certainly didn’t pour out like your typical Belgian pale ale – it had a deep copper brown colour to the body and a couple of fingers’ worth of plump white head that faded fast. It was also very much malt forward with lots of biscuit and caramel aromas coming through. However, there wasn’t much of a hop aroma during smelling or drinking. There was though a large fruity nose to Harvestmoon Aki Mugi – perhaps from the yeast – but definitely something Belgian-like going on there. The biscuity flavours were subdued compared to the caramel flavours coming through the beer; however, there was a slight hoppy bitterness to Harvestmoon Aki Mugi – though not enough to screw your face up. The fruity yeasty flavours came through once again and brought something different but the flatness of the beer was disappointing. Not even the magical IPA glass could bring Harvestmoon Aki Mugi to life. No wonder Harvestmoon Aki Mugi comes and goes – best to either let it go for good or come back with a revised recipe.